John Sims, Director of Mineral Resources chose Geovariances for quantifying the Return On Investment of further drilling and the risk on resource estimation. With Geovariances expertise in Advanced Geostatistics, GEOVARIANCES has been providing Coeur with global solution – software product, consulting and training – which fits perfectly John Sims’ expectations. Coeur d’Alene Mines Corporation is one of the world’s leading silver companies and also a significant gold producer. Coeur operates several mines in the world and is presently constructing two of the world’s largest silver mines. The Company also conducts exploration activities worldwide. Several hundred meters of drilling is a costly undertaking and mining companies such as Coeur d’Alene often hesitates in increasing their sampling campaigns without knowing whether it is worthwhile, in other words, whether they will gain in the estimated recoverable resources. Achieve sophisticated workflows as the one described hereafter. “To quantify the Return On Investment of further drilling, I needed to run a sophisticated workflow on my dataset. To reach my goal in an efficient way, I was seeking a tool that would allow me to achieve the workflow in its entirety in one single software package. Indeed, I have no time to spend in going back and forth from one software package to another one.” John Sims, Coeur Director of Mineral Resources and certified QP explained. “I contacted GEOVARIANCES because they are known as the leader in advanced geostatistics and offer solutions that you do not find anywhere else.” he added. To practice and validate the workflows on Coeur’s main projects. ISATIS numerous geostatistical capabilities (kriging and conditional simulations) come up to the first expectation, whereas its modularity enhanced by the journal file system allows to create sophisticated and interactive workflows easily usable by beginners. This kind of one-to-one mentoring has been particularly valuable to John Sims. Indeed, it allowed him not only to become familiar with ISATIS but it also allowed him to build and run the workflow he needed in three weeks. And this, under the guidance of an expert geostatistician. The workshop was carried out on data coming from Coeur Palmajero project (Fig.1). 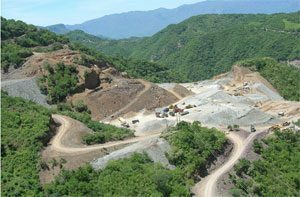 Palmajero is located in Mexico, inside the Sierra Madre Precious Metals Belt. The deposit consists in two very large vein systems, with auxiliary hanging wall and footwall veins. 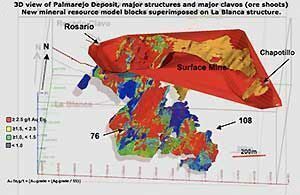 Each major vein is composed of different mineralized areas corresponding to different clavos (ore shoots). An open pit mine is first scheduled, likely followed by an underground mining plan (Fig.2). Beyond ordinary kriging block modeling, geostatistical conditional simulations were used for risk analysis: uncertainty assessment on tonnage and metal predictions, and also on grade variability. The main objective was to take advantage of these simulations, at the least cost, for drilling optimization. For each drilling strategy (with different sampling distance), calculating the optimal, estimated and recovered values for tonnage, metal, and mean grade recovered after applying an economic cutoff. Results obtained on the 76 clavo are displayed in the table below for a regular 55×55 m sampling compared to a 30x30m one. They are expressed in percentage of the real in-situ quantities, considered unknown. The estimated value is derived from the ordinary kriged block model, as it would be done in classic resource estimation. The recovered value is derived from the simulated block model and represents the real value that would in fact be recovered. Comparing estimated vs. recovered allows a quantitative prediction of the error related to the smoothing effect of kriging. Comparing both columns gives quantitative results on the gain of prediction when drilling is refined: the tonnage overestimation is reduced and the mean grade is closer to 100%. Metal quantity does not vary significantly because the tonnage overestimation is compensated by grade underestimation. GEOVARIANCES succeeded in sharing its skills at a high flexibility and expertise level. Indeed, GEOVARIANCES workflow allowed Coeur d’Alene to get a quantitative solution which represents a distinctive key for risk management and extra drilling decision. Given these successful results and upon full validation of the workflow by Coeur’s management, John Sims is willing to apply the methodology on other Coeur’s main projects. To achieve this in the most efficient way, GEOVARIANCES will provide Coeur with technical support and will give them the expert advice they need. Another possible promising development is to extend the technique to the multivariate framework for Coeur’s combine silver/gold projects. Indeed, by taking advantage of the existing correlation between silver and gold grades, Coeur will gain confidence in their resource estimations.